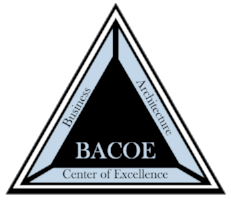 At the BACOE, we pride ourselves on giving you the same training in Business Architecture at every one of our workshops. SAMUEL B. (Sam) HOLCMAN is the Chairman of the Pinnacle Business Group, Inc., the Managing Director of the Enterprise Architecture Center Of Excellence (EACOE), and the Business Architecture Center Of Excellence (BACOE), and the President of the Zachman Institute for Framework Advancement (ZIFA). He is considered the “practitioners practitioner” in Enterprise Architecture and Business Architecture, and the leading implementer and world-wide educator and trainer in Enterprise Architecture and Business Architecture methodologies and techniques. The Pinnacle Business Group, Inc. and its associated organizations provide its clients with innovative, yet practical solutions to a range of business and systems related challenges and activities. Mr. Holcman conceptualized and constructed a unique look at system development methodologies, which resulted in the highly regarded ForeSightTM methodology and methodology management product. He has developed a strategic planning process that is used by many Fortune 500 companies, and is the co-developer of the widely used accelerated analysis (JAD-like) technique known as Rapid Analysis. He has also developed an innovative approach to Business Process Re-Engineering known as Business Process VisualizationTM and Organization Network AnalysisTM. In association with Mr. John Zachman, he formed The Zachman Institute for Framework Advancement (ZIFA), to explore, explain, and share the concepts of enterprise architecture. He has developed the Intellectual Capital Maturity ModelTM and the Enterprise Architecture Maturity Model. He has also developed and published works on Cooperatively Optimized Relationships (COR). To better understand an organizations “DNA”, Sam led the development of The Enterprise FrameworkTM and The Business Architecture FrameworkTM. Both The Enterprise Framework, and The Business Architecture Framework have received worldwide acclaim for their understandability, and usability, while maintaining theoretical purity. He recently published “Reaching the Pinnacle—a Methodology of Business Understanding, Technology Planning, and Change”. Sam was with Ford Motor Company for 11 years, Vice President of a robotics and factory automation firm for two years, a senior member of a technology delegation to the People’s Republic of China, and a member of a technology delegation to the Commonwealth of Independent States (Soviet Union). Sam has a Bachelor’s degree in Bioengineering and Master’s Degree in Electrical Engineering from Wayne State University in Detroit, Michigan, and a Master’s in Business Administration from the University of Michigan, Ann Arbor. He has been elected to Eta Kappa Nu (electrical engineering honors society), and Tau Beta Pi (engineering honors society), and is a member of numerous societies and professional organizations, and is a frequent speaker at seminars around the world.